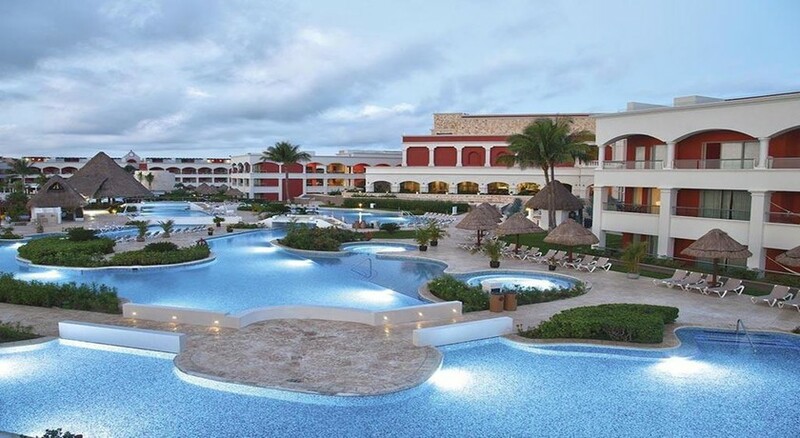 The Hard Rock Hotel Riviera Maya is located on a private white sandy beach, in the Puerto Aventuras area. This all inclusive luxury hotel caters for both adults only and families with two separate sections available to stay in, add to this the traditional decor, unforgettable hospitality, fabulous guest amenities and, of course, rocking entertainment – and Hard Rock Hotel Riviera Maya ticks all the boxes if you're after an all-round resort in Cancun. The hotel features beautifully decorated Deluxe Rooms, separated into categories to suit all guests, each with first-class amenities and a balcony. The resort also has spectacular swimming pools - including a huge lagoon-style pool and a quaint natural cove on the private beach to swim in - an adults only Rock Spa, gym, Kids' Club, a handful of sports activities and plenty more. When hunger strikes, hit the Hard Rock Hotel's restaurants and bars, with 12 venues to choose from for worldwide cuisine, snacks and drinks. 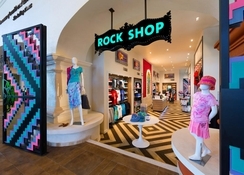 The Hard Rock Hotel Riviera Maya is located on a private white-sand beachfront in the Puerto Aventuras area of Cancun. Access to a secluded cove is a major draw for guests who like to soak up the sun in a serene setting, while close by you have the lively Puerto Aventuras town bustling with a marina, shops, cafés and restaurants - providing guests with the best of both worlds. 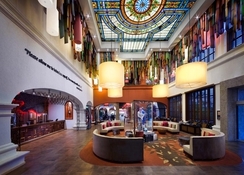 The Hard Rock Hotel Riviera Maya has 1,264 guest rooms varying from Deluxe Rooms to Suites that treat guests like rock stars. 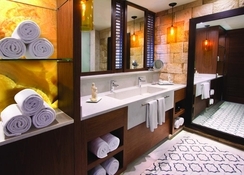 These rooms are equipped with hydro spa tub, free WiFi, private balcony, personal liquor dispenser, minibar, flat screen satellite TV, individually controlled air-conditioning, Rock Spa bath amenities, safety deposit box, coffee maker, telephone, alarm clock, hairdryer, iron and ironing board. 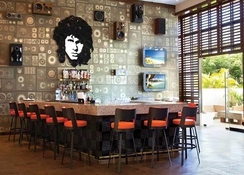 Hard Rock Hotel Riviera Maya has nine delightful restaurants that serve cuisines from around the world. The Market is a buffet restaurant that serves International cuisine for all major meals. Pizzeto serves delicious pizzas, whereas Frida is great for Mexican dishes. Cafetto serves a filling breakfast and is the place to head for snacks and hot beverages throughout the day. There are several bars including pool bars and an adults-only Heaven Bar & Lounge. The hotel is home to as many as five swimming pools, a waterslide and expansive gardens which provide solace to the guests. Facilities like tennis courts, bicycles, kayaking, snorkelling and strolls to explore Spider Monkey’s habitat are available in the hotel for activity lovers. While, the luxurious Rock Spa has an exclusive menu of treatments and massages for guests who wish to unwind. There are two 18-hole golf courses, as well as key tourist attractions such as Chichen Itza to explore in the surrounding area, with deep sea fishing and scuba diving sites nearby to explore, too. 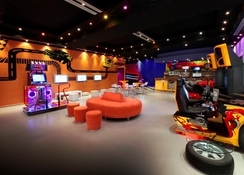 Children can have a good time at the interactive play rooms and the hotel's dance studio. NOTE The Zip line at the top of the slide is open 2 day a week, from 11:00 am to 3:00 pm. Errata Heaven section: On next August 19th 2018, building 4 on Heaven side will be become a Family section. Due to this change Heaven Inventory room will be decreased to 389 instead 577 rooms. 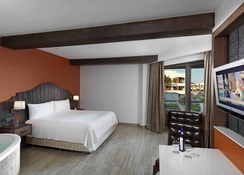 During the follow dates Hard Rock Hotel Riviera Maya will manage as a family Hotel. Not adult section. We work hard to assign on building 1 and 2 of Heaven area adults only however children must be welcome at all restaurants and areas. DESCRIPTION: All arrivals from April 1st to Dec 20th, 2018 with a minimum stay of 7 nights will be entitled to UNLIMITED SPA SERVICES. This mean that now all Rock Spa treatments and packages are included WHITHOUT LIMIT in your stay. While you enjoy this unlimited spa promotion, you can also use your Limitless Resort Credit to add more activities to your stay like tours, treatments in the beauty parlor, romantic dinners and much more. Please verify BW, TW and Blackout of each promo. REMARKS: Applies to NEW reservations only. Reservations with overlapping dates qualify; discounts will apply for nights within travel window. Promotion is subject to change without prior notice. We reserve the right to discontinue this promotion at any time. All previous sent close outland inventorv changes apply and remain in place. Not applicable to reservations with travel agent rate, FAMS, complementary or compensatory stays. Promotion code MUST be reported at time of booking for reservation to be entered correctly in our system.UNLIMITED SPA. NOTE We take this opportunity to remind you that during the follow dates Hard Rock Hotel Riviera Maya will manage as a family Hotel and Not adult section- We work hard to assign on building 1 and 2 of Heaven area adults only, however, children must be welcome at all restaurants and areas. Christmas and New Year Dec 21st, 2018 to Jan 2nd, 2019.